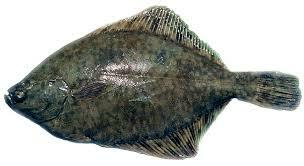 English sole are flatfish that inhabit the Pacific Ocean, from the Aleutian Islands down to Baja California, Mexico. 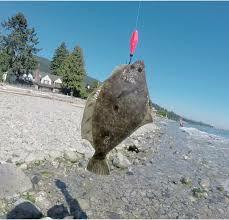 In Canadian waters, the densest populations occur off the coast of British Columbia. They are migratory but usually do not undertake long migrations. They can live at depths of more than 500 metres, but are usually found at depths of less than 150 metres. English sole are diamond-shaped and have flat, compressed, brown to olive-brown coloured bodies, sometimes mottled with white. They are righteye flounders with their second eye set high and visible from the blind side. Their blind side ranges from white to a muted yellow with a brownish tinge. They have small, asymmetrical mouths and pointed snouts, and can grow to more than 50 centimetres in length and weigh more than a kilogram. Females usually are much larger than males and constitute the majority of the commercial catch. These fish are generally 1 to 2lbs in size, sometimes smaller depending on where you are fishing. Although they tend to be small, heavy gear may be needed at times if you are fishing in areas where there is a strong current. If you are fishing off of piers and beaches at a bay, where current is weak; then a light spinning outfit is a fun setup for these fish. To catch English sole successfully, you need to be fishing on the bottom. A sinker weight is needed to anchor your bait either on the muddy bottom or just above it. Typical bait used for English sole include worm, shrimp, prawn, fish pieces. Jigs and small lures can sometimes yield some catches. Summer and early autumn are the best times to catch them but it does vary on your area. They feed mainly at night and close to the shoreline. If you catch one there are often many more in the same area. Best bait is black lug on a flowing trace with small hooks 4 - 6. There main feeding time is 2 hours after dusk or 2 hours before dawn. They bury themself in the sand when the tide is running strongly and swim out to face the other way as the tide turns. This is also a good time to catch them. You’ve now reached the end of your english sole educational journey. We hope that the information provided on this page is useful to you. You may want to learn more about english sole, so that’s why we put together the below list of additional resources. Below you’ll find some 3rd party resources related to sole fishing. Hopefully they are useful to you. Sea Angling Flatfish fishing made easy - by David A. Weaver. An indispensable guide to Dab, Flounder, Plaice, Dover sole, Lemon Sole, Megrim, Brill, Turbot, Sand sole and Halibut fishing including the use of sea angling methods and techniques. English Sole – Wikipedia – Learn more about this flatfish on Wikipedia.